It’s been a while since the last time I posted and it looks a if I am posting here mainly to brag. A little late, but I wanted to post that I took the VCP510 exam last month and finally passed it. I state finally because this was the second attempt at the exam. 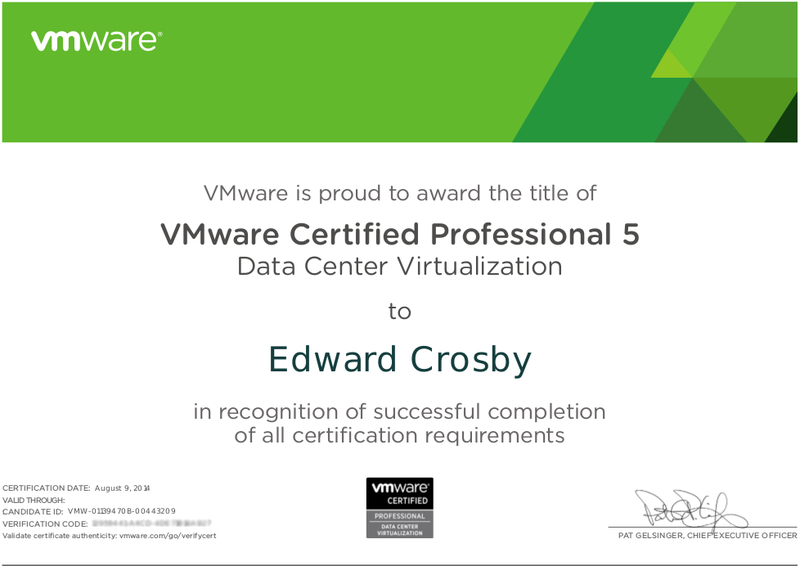 It was a difficult exam for me but now I am proud to say that I am a VCP5-DCV, VMware Certified Professional 5 – Data Center Virtualization. 2. VMware’s own VCP5-DCV Exam Blueprint was full of valuable information that helped me study for the exam. I had originally purchased a book titled VCP5 VMware Certified Professional on vSphere 5 Study Guide by Brian Atkinson and used it to study for my first attempt at the exam but it wasn’t enough. However, it is still a good book to use as reference material during your studying and really useful when working in a lab environment. But to really study and get fully prepared for the exam, I can’t recommend the VCP5-DCV Exam Blueprint enough. This entry was posted in VMware by Ed. Bookmark the permalink.